The term "bromelain" may refer to either of two protease enzymes extracted from the plants of the family Bromeliaceae, or it may refer to a combination of those enzymes along with other compounds produced in an extract. Although tested in a variety of folk medicine and research models for its possible efficacy against diseases, the only approved clinical application for bromelain was issued in 2012 by the European Medicines Agency for a topical medication called NexoBrid used to remove dead tissue in severe skin burns. There is no other established application for bromelain as a nutraceutical or drug. Pineapples have a long tradition as a medicinal plant among the natives of South and Central America. The first isolation of bromelain was recorded by the Venezuelan chemist Vicente Marcano in 1891 by fermenting the fruit of pineapple. In 1892, Russell Henry Chittenden, assisted by Elliott P. Joslin and Frank Sherman Meara, investigated the matter more completely, and called it 'bromelin'. Later, the term 'bromelain' was introduced and originally applied to any protease from any member of the plant family Bromeliaceae. Bromelain is present in all parts of the pineapple plant (Ananas sp. ), but the stem is the most common commercial source, presumably because usable quantities are readily extractable after the fruit has been harvested. Produced mainly in parts of the world where pineapples are grown, such as Thailand or Malaysia, bromelain is extracted from the peel, stem, leaves or waste of the pineapple plant after processing the fruit for juice or other purposes. The starting material is blended and pressed through a filter to obtain a supernatant liquid containing the soluble bromelain enzyme. Further processing includes purification and concentration of the enzyme. At the optimum temperature, the enzyme acts the fastest, but (at least the fruit variant) is destroyed within a few minutes. After an hour at 50 °C (122 °F), 83% of the enzyme remains, while at 40 °C (104 °F), practically 100% remains. As a result of this, the optimum temperature for maximum cumulated activity over time is 35-45 °C. At room temperature, the enzyme can survive at least a week even under multiple freeze-thaw cycles. 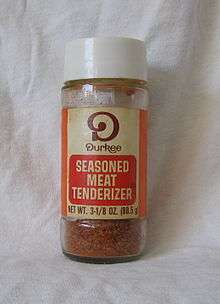 A jar of meat tenderizer containing bromelain. Along with papain, bromelain is one of the most popular proteases to use for meat tenderizing. Bromelain is sold in a powdered form, which is combined with a marinade, or directly sprinkled on the uncooked meat. Cooked or canned pineapple does not have a tenderizing effect, as the enzymes are heat-labile and destroyed in the cooking process. Some prepared meat products, such as meatballs and commercially available marinades, include pineapple and/or pineapple-derived ingredients. Although the quantity of bromelain in a typical serving of pineapple fruit is probably not significant, specific extraction can yield sufficient quantities for domestic and industrial processing, including uses in baking, anti-browning of cut fruit, textiles and cosmetics manufacturing. A concentrate of proteolytic enzymes enriched in bromelain is approved in Europe for the debridement (removal of dead tissue) of severe burn wounds under the trade name NexoBrid. Bromelain has not been scientifically proven to be effective in treating any other diseases and it has not been licensed by the Food and Drug Administration for the treatment of any disorder. Available in some countries as a product under the name Ananase, bromelain began its reputation for various uses in folk medicine. While there have been studies which positively correlated the use of bromelain with reduction of symptom severity in osteoarthritis, "[t]he majority of the studies have methodological issues that make it difficult to draw definite conclusions", as none definitively established efficacy, recommended dosage, long term safety, or adverse interaction with other medications. Systemic enzyme therapy (consisting of combinations of proteolytic enzymes such as bromelain, trypsin, chymotrypsin, and papain) has been investigated in Europe to evaluate the efficacy in breast, colorectal, and plasmacytoma cancer patients. Bromelain may be effective as an adjunct therapy in relieving symptoms of acute rhinosinusitis in patients not treated with antibiotics. 1 2 "European Public Assessment Report: NexoBrid, concentrate of proteolytic enzymes enriched in bromelain" (PDF). European Medicines Agency. December 2012. ↑ "Vicente Marcano (in Spanish) Quote from Google translate: "New theory about the phenomenon of fermentation": "See also the bromeliad (for Annana Bromelia L.) pineapple, which is responsible for many phenomena of fermentation of the fruit. This finding, while not making Marcano, was actually made by him, as later confirmed by Dr. RH Chittenden, of Yale University, who argues that "the bromeliad was discovered by a Venezuelan scholar named Vicente Marcano."". Pioneers of Venezuela, PDVSA-Intevep. 1997. ↑ Chittenden, R H; Elliott P Joslin; Frank Sherman Meara (1892). "On the ferments contained in the juice of the pineapple (Ananassa sativa): together with some observations on the composition and proteolytic action of the juice". Transactions of the Connecticut Academy of Arts and Sciences. 8: 281–308. 1 2 3 4 5 6 7 Arshad ZI, Amid A, Yusof F, Jaswir I, Ahmad K, Loke SP (2014). "Bromelain: an overview of industrial application and purification strategies.". Appl Microbiol Biotechnol. 98 (17): 7283–97. doi:10.1007/s00253-014-5889-y. PMID 24965557. 1 2 3 Ketnawaa S, Chaiwutb P, Rawdkuen S (2012). "Pineapple wastes: A potential source for bromelain extraction". Food and Bioproducts Processing. 90 (3): 385–91. doi:10.1016/j.fbp.2011.12.006. ↑ Jutamongkon R, Charoenrein S (2010). "Effect of Temperature on the Stability of Fruit Bromelain from Smooth Cayenne Pineapple" (PDF). Kasetsart Journal: Natural Science. 44: 943–8. ↑ Hale, Laura P.; Greer, Paula K.; Trinh, Chau T.; James, Cindy L. (2005). "Proteinase activity and stability of natural bromelain preparations". International Immunopharmacology. 5 (4): 783–93. doi:10.1016/j.intimp.2004.12.007. PMID 15710346. 1 2 3 Chaurasiya RS, Sakhare PZ, Bhaskar N, Hebbar HU (2015). "Efficacy of reverse micellar extracted fruit bromelain in meat tenderization". J Food Sci Technol. 52 (6): 3870–80. doi:10.1007/s13197-014-1454-z. PMC 4444899 . PMID 26028772. ↑ Walker AF, Bundy R, Hicks SM, Middleton RW (2002). "Bromelain reduces mild acute knee pain and improves well-being in a dose-dependent fashion in an open study of otherwise healthy adults". Phytomedicine. 9 (8): 681–6. doi:10.1078/094471102321621269. PMID 12587686. ↑ Hale LP, Greer PK, Trinh CT, James CL (2005). "Proteinase activity and stability of natural bromelain preparations". Int Immunopharmacol. 5 (4): 783–93. doi:10.1016/j.intimp.2004.12.007. PMID 15710346. ↑ Brien S, Lewith G, Walker A, Hicks SM, Middleton D (2004). "Bromelain as a Treatment for Osteoarthritis: a Review of Clinical Studies". Evid Based Complement Alternat Med. 1 (3): 251–7. doi:10.1093/ecam/neh035. PMC 538506 . PMID 15841258. 1 2 "Bromelain". National Center for Complementary and Integrative Health, US National Institutes of Health. 20 April 2016. Retrieved 24 April 2016. ↑ Beuth J (2008). "Proteolytic enzyme therapy in evidence-based complementary oncology: fact of fiction?". Integr Cancer Ther. 7 (4): 311–316. doi:10.1177/1534735408327251. PMID 19116226.